Congressman David Schweikert, United States House of Representatives Arizona CD6, was luncheon speaker at a recent Rotary Club of Scottsdale meeting held at Scottsdale's McCormick Ranch Golf Club's Pavilion. When introducing Congressman Schweikert, Rotarian Jim Bruner said that Schweikert is serving his fourth term in the United States Congress. Congressman Schweikert holds a seat on the Ways and Means Committee, having previously served on the Financial Services Committee. Congressman Schweikert sits on the bicameral Joint Economic Committee, co-chairs the Valley Fever Task Force, and is Republican co-chair of the Blockchain Caucus, the Tunisia Caucus and the Caucus on Access to Capital and Credit. 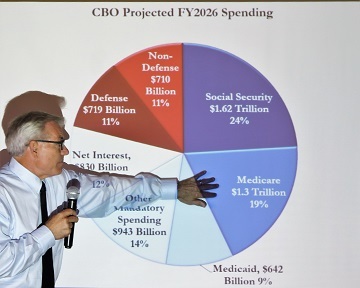 The topics Congressman Schweikert addressed during his talk centered around: Arizona's changing birthrates; Blockchain technology's impact on personal data collection; Congressional Budget Office's fiscal year 2026 spending projections; tax cut impacts on Arizona jobs and household incomes; public debt; and Valley fever research advances. Rotarians took advantage of the Q/A time to address: challenges of Medicare; talent-based immigration system; border security and public/private lands; border security and advanced technology opportunities; Congress's current 25 percent turnover rate; term limits; and "what happened to the Tea Party?" Congressman Schweikert noted that his father had been Rotary Club of Scottsdale member. In closing, the Congressman reflected on how advanced technology, hospital design and placement, as well as, allocation of resources could positively impact Medicare's future. During the meeting, Rotarian, Dale Gray provided attendees with an update about his recent trip to Sonora Mexico in support of the Club's international matching-grant project and partnership with Project C.U.R.E. He and others have been delivering in total $800,000 in medical supplies. Rotarian Gray noted that during his recent 1,500 mile road trip to seven different Sonora Mexico hospitals, Rotarians from all over Sonora Rotary District 4100, assisted and welcomed our Club's efforts to support Sonora hospitals needs. For more information about the Rotary Club of Scottsdale, visit scottsdalerotary.org. Visitors to Club meetings are always welcome. Call 480-945-6158.